*Designed in collaboration with landscape architects Seamon, Whiteside & Associates, Inc. and Gerald Vander Mey, Campus Master Planner, Clemson University. Military Heritage Plaza is a memorial to honor Clemson University’s history as a military academy. Four plazas symbolize the lives and values of the cadets as they matured in the four years as a Clemson student. These values are carved into the steps leading in and out of the plaza. The ghost of the past that still influences the institution is represented in the bronze footsteps of a company of cadets standing at attention. Today’s student can also step into an actual bronze mold to see if they “fit the mold of a Clemson cadet.” The plaza opens on to historic Bowman Field where the cadets used to march every morning. 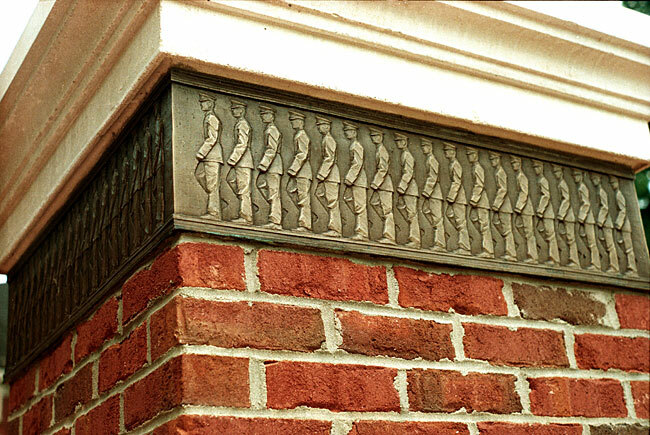 This tradition of discipline is also represented in the bronze relief of marching cadets. Throughout the plaza the cadet’s tradition of military service is further honored in a course of Lucite bricks with medals embedded. These medals, donated by the Defense Department, were awarded to Clemson alumni over the last 150 years and include the medal of honor.